Jerry Dresden, Hake Diver Elite, scooted up Lexington Avenue on a brilliant, late-fall Sunday. His SCABA equipment was working swimmingly. Against all odds he would, were his mission successful, be the first hake to successfully accomplish two of the most impressive feats the Phylum Chordata had ever attempted: to not only navigate New York City, but to fly. His grandfather, Budge Dresden, the pioneer of hake exploration, had chosen New York City to explore in 1990. On a rainy summer day Budge had flopped onto land in his rudimentary Walking Bell, only built to last for two hours above water. Budge’s series of yanks on the water supply-line — a one, two, two, one combination that signaled, “Haul me in” —came after an even ten hours. Despite his excessive, fresh air exposure, he insisted, to the protestations of his underwater research team, on going back ashore the very next day. He was up for a full eighteen hours before his team felt tugging at the line. When they reeled him in, only the dorsal fin-shaped fabric to which the hose was connected remained. Budge’s journey, though unsuccessful, had yielded enough data to spark the hake public imagination and other expeditions were undertaken. Bilton Peabody, a closeted alcoholic and wife-beater, made deep and fruitful forays onto the boardwalk of the Jersey Shore from 1993-96. Renaldo Nestle, brother of famed conservative hake politician Dill Nestle, traveled up the Seine in 2001 and made four tours of Paris that were later adapted into the blockbuster hake film, “Paris by Land and Love.” Recently, though, there had been only quotidian trips: beach buzzes, dock flop-bys, coastal sneaks, but nothing groundbreaking thanks a tightening of the THE — Terrestrial Hake Expeditions — budget and a contracting public imagination. An impressive mission was needed to reignite the public imagination. And so, instead of piddling the rest of THE’s meager budget into more flop-bys, the hake powers that be had decided to bet it all on one last-ditch act of bravado. That was why they’d chosen Jerry. He was the grandson of a hake hero, the best in the THE class of 2014 and, likely, the best ever. He’d been proven stalwart, unflappable and generally a nice young fish, genial to a fault. The stakes were immense. If his mission failed, it would most likely denote the end of above ground hake exploration indefinitely. Success, though, promised an expeditionary resurgence and possible rallying cry for all hake-kind. Jerry stopped where his mind was going by focusing on the humans. With no known predators but themselves, homo sapiens sapiens seemed oddly nonplussed at Jerry’s SCABA suit. The suit’s fuselage was built to resemble a Cairn Terrier — the only archival footage available to THE researchers in constructing this newest suit had been, oddly enough, the Wizard of Oz — though, hair being a sticky wicket for hake craftsmanship, the suit looked less like a dog and more like a slimy badger. But none of that mattered. His grandfather’s first expedition had delivered the invaluable discovery that no humans really cared about hake explorers. With no known predators but themselves, humans had seemingly regressed to a state of permanent un-vigilance. Certainly some were curious enough to glance at the SCABA suit— usually these inquiries came from adolescent humans, older ones tended to simply go about their business — but most lost interest quickly. It couldn’t be ignored. The restriction of movement aboveground affected Jerry more than he’d imagined. He had the urge, as any fish would, to explore all the surroundings: up, down, left and right. Being stuck to one surface was altogether disorienting… Everything felt too close. Jerry’s extensive training had never prepared him for this intense a feeling of immobility. Jerry pushed it out of his mind again. He had not been chosen for nothing. After gathering up a NY Daily News, a gum wrapper, seven cigarette butts and a paper plate he activated “Service Dog” mode and artfully snuck aboard a bus bound for JFK. While snappers were hailed as being the most technologically advanced and bluefin were known for their nearly religious investment in terrestrial research, no fish in the sea could beat the ingenuity of a hake. It was why hake-kind had always gone farther and seen more: they could get places. And Jerry was doing just that. Human flight had long been a fascination of the hake researchers. Attempting to glide through air as fish so effortlessly danced through the water seemed the ultimate act of hubris. Impossible even. Yet, they had accomplished it and the fish were determined to understand its implications firsthand. In the terminal Jerry slipped effortlessly past the nitrile rubber gloves of security. Feeling the hubris of success, Jerry fished in a trashcan for exploratory samples of a pumpkin spice latté, one of many boons desired by the THE. Though he was closer to the plane, Jerry’s mind remained an un-ruffled slate. His movements precise and his manner perfected. I’ve got this, Jerry thought. Easy. Yet in stepping aboard the plane, he thought have planes always been this… tight? What sort of tube had he crept into? Surveying the plane’s less-than-crowded interior Jerry secreted himself under a seat about midway-back in the plane. The flight attendants announced that the cabin door had been closed. And like a stiff, wooden frame, gnawed and gnawed by tiny termites, Jerry began to feel his poise crumble. Through his suit he could smell the noxious recycled air inside the cabin — acrid propane smog. There were bangs, the sounds of grunting drills. Surely the humans knew what they were doing, Jerry thought. But then again, thought Jerry, perhaps they didn’t. Gill-tightening claustrophobia seized him. The clinical walls of the fuselage crept inward. Jerry felt the water rushing through his gills. Panic caromed through his head. His SCABA suit felt as if it were constricting. He had to get out. Had to get out! “You gonna stick this one out, Jerry?” said the voice of Budge Dresden, hake explorer. Is this what happens when you die? Jerry thought as his last watery breaths escaped him. Hearing the voice of your hero before an ignominious death? Jerry turned and forgot everything he’d been thinking. Sitting in a fine tweed suit, cane at his side, bowler hat resting upon his lapless lap was Budge Dresden himself. Alive, 5-feet long from unchecked growth and breathing recycled air as if it were crystalline Bermuda reefwater. Jerry did. The cabin air had cleared of its dreadful stench and passed cool and crisp through his gills. He lay, breathing, for a little while, feeling the walls decompress, his mind return to its familiar, calm state. “Now get up here,” Budge patted the seat beside him with a flipper. Jerry, using the terrestrial movement techniques he’d practiced, flopped up. The engines cascaded to life, their hurricane gyrations rumbling the fuselage of the ship. No longer was Jerry worried; he was confused, in awe. Jerry looked over at Budge, the same Budge Dresden captured in a coral statue outside the hake Memorial Museum of Exploration: impressive jaw jutting outward, un-shuttable eyes looking patricianly upon him. “How are you still alive?” asked Jerry. “Don’t you know?” asked Budge. Budge nodded at the words they were made of. The bedraggled manchild at his computer, blearily typing at six in the morning on a damn Tuesday trying to finish a story that was already beyond the pale of implausibility. They sat in silence for a spell, feeling the plane gently rumble up into the crystalline sky. “Depends on what?” Jerry asked. Budge, or the brain of budge that was really the writer’s brain, thought about it for a second. “Considering,” Budge said. “That you’re just an analogy meant to represent realistic human emotion and hopes, I have two options. One, I could disappoint the reader by actually remaining real, thus returning with you to the hake kingdom as the true hero: the one who learned how to live on land. That would, of course, make you a less than stellar side note in history and leave the question of how the heck we’re both breathing up here in a plane in the sky that the writer still hasn’t fully figured out how he wants to handle. That’s not what the readers want, though. Jerry nodded. He kind of understood. It was all getting a bit heavy. “Which do you think it’ll be?” asked Jerry. Jerry nodded as his mouth pulled into a slimy, involuntary grin. Beneath them the fang of Manhattan slid into haze. The two hakes gazed out the window — silent together in mutual admiration and contemplation — while the sapphire sky and sea melded into one endless horizon. I’ve been saving this review for quite some time. 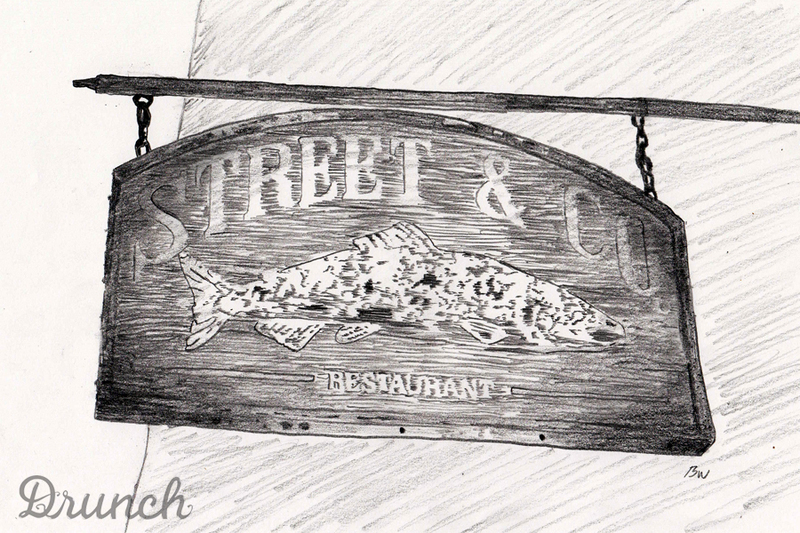 Before Central Provisions slapped the Portland culinary waters with its formidable flukes, I would have said that Street & Co. was the best meal to be had in Portland (yes, even over Fore St.). I know that probably galls many of the Fore St. fan club (it’s the better Street restaurant damn it! ), but it’s purely from my experience living here for the past two-ish years. Street & Co. with its fisherman’s stew, its sole francaise and, last but not least, one biblically moist swordfish steak has proven itself to be a sumptuous pescitarian feast waiting to happen. It’s not cheap by any means, but it’s not going to bust you wide open like a Hugo’s, per se. It’s a restaurant made for “occasions.” Take a date. Take your parents. Take yourself. Unless you summer on an island, you probably won’t be able to afford to make it a daily excursion. Not that this place actually feels like the below decks living quarters of a working ship, but it’s got a comfortable and intimate feel that lends itself perfectly to their fish-focused menu. Most often, when the prices rise, so does the service quality. S&C is no exception. I said it before and I’ll say it again, this is a Portland staple. Street and Co. has yet to serve me a meal that was less than belly-pattin’ fine. Even Ahab would (perhaps) crack a smile.